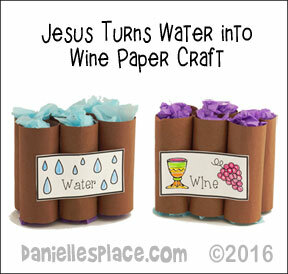 The following crafts and activities come from the Bible lesson "Jesus Turns Water into Wine" on The Resource Room availble to members. 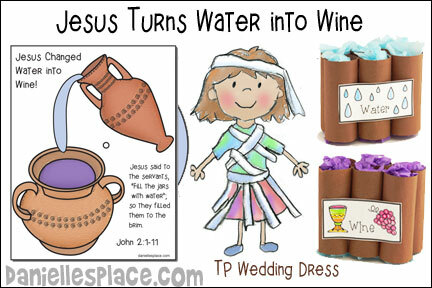 Use this hands-on craft and activity to re-inforce the Bible lesson about Jesus turning water into wine. Children color the picture and attach the wheel to the back of the picture. Turning the wheel changes the water (light blue color) to wine (purple or burgandy color). To make this craft you will need white card stock (heavy paper) and blue card stock or construction paper. If you have younger children, you can prepare the craft ahead of time and just have them color the picture. 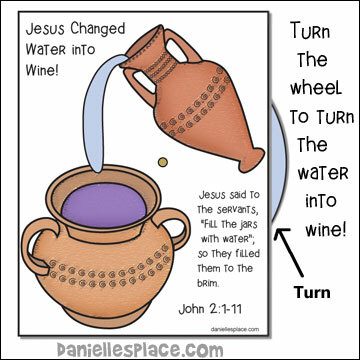 They will enjoy turning the wheel to have the "water" turn to "wine". 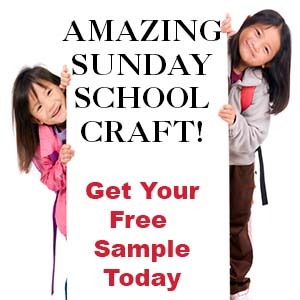 This craft is available to members on The Resource Room. Make "Water to Wine Pots"
Brown Construction Paper 12" x 9"
1. Before class cut the construction paper in half lengthwise to make sheets 12" x 6". Cut those pieces in half to make 6" x 4 1/2". 3. Staple or glue six tubes "pots" together. 5. Cut the tissue paper into 6-inch squares. 7. Have your children color the labels and glue one to each side of the tubes. Make sure that when the purple tissue paper is on top the wine label is readable, and when the blue "water" side is up the water label can be read. Many of the ideas for this lesson were sent in by Theresa Bostick. She made veils for the girls to wear on their heads using white 1/4" elastic and white netting and bow-ties for the boys to wear around their necks using black 1/4" elastic, Velcro and black felt. She also took a group wedding picture. Thanks, Theresa for all the great ideas. This is a game that I remember playing when I was in children's church over 20 years ago. Instead of saying duck, duck, goose, have the children say water, water, wine. 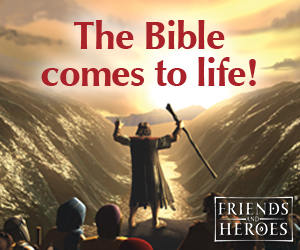 This is an easy way to reinforce Jesus' first miracle of him turning the water into wine. I use it with my 1 and 2 year olds now and they love it. 1. The week before this lesson send out wedding invitations to your students. 2. 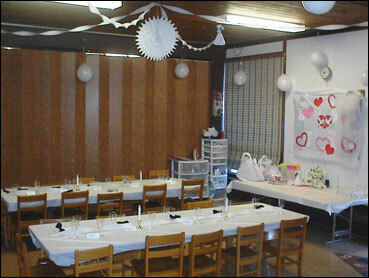 Decorate your room with wedding shower decorations or have the children who arrive early help. 3. In class have your students decorate wedding cupcakes. Go over the Bible verse several times so that the children can say it without help. Have the children all stand in a large circle. Give a child a beanbag or other object. Play like hot potato. When you start the music the children start passing the beanbag, but they must first say the verse before they pass it. For young children use just the last part of the verse ("He cares about what happens to you."). When the music stops the child who is holding the bean bag must sit down. You can also have more than one bean bag going around the circle at the same time. You can also play by having the children pass the beanbag until the music stops. The child who is holding the beanbag must say the Bible verse. 1. Break the children up into teams of three or four. 2. 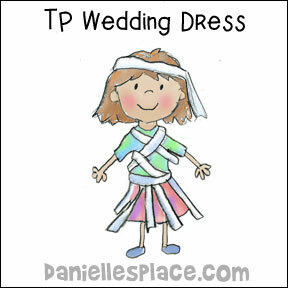 Give each team a roll of TP and have them dress up one of their team members as a bride. 3. Have the children vote on which bride has the best dress. You will find more ideas for this lesson on The Resource Room.